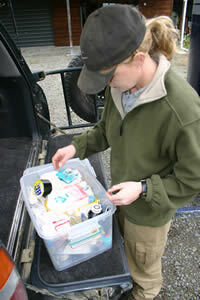 Horse safety specialist Michelle Staples shares some trailer maintenance tips. Before loading your precious cargo onto your horse float, there are a few important checks you should make so you can be sure your trailer is ready to do the job it's intended for. If you're like most of us, your trailer sat idle over the winter. Harsh weather takes its toll on mechanical equipment, so it is wise to go over your float with a "fine-toothed comb" before hitting the roads. Writing down a plan and sticking to it is the safest way to make sure all problems are fixed; all areas of concern addressed. Start by taking some pictures of the trailer from the front, sides and back. Print them up on plain paper so you can write over them. List the main areas you need to check on the back of one sheet, and then start a visual check of the trailer. These areas are: tyres and wheels, floor and body, brakes, hitch, wiring, suspension, safety equipment including first aid kit. Are tyres in good condition? Look for bulges, slices, bare spots, worn tread. Are tyres the right size for the load? Rotate the tyres (including balancing and properly inflating them). 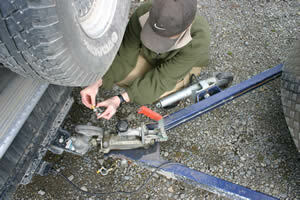 Clean and repack wheel bearings and replace seals. Are the wheel lugs tight? Are they all there? Check for floor for soft spots, rotting, splintering. This includes the ramp if you have one. Replace damaged floor boards and treat floor with a preservative. If you are using mats, do they fit snugly? Are they worn and need replacing? Check the registration to be sure it's up-to-date. Make sure the license plate is positioned so there are no sharp edges exposed. Check and oil all hinges, dividers, doors, locks, and windows. Check all gaskets and molding to ensure good fit of windows. Clean and oil the jack stand. Grease the ball and the coupler. Inspect and service the brake drums and wheels. Check fluid levels and lines to hydraulic brakes. Do a loaded and unloaded drive test to check for even stopping. Inspect emergency trailer brake battery. Check levelness of hitched trailer. Is the wiring intact, clean and secured? Grease the springs, shackles if appropriate. Check shock absorbers and bushings. 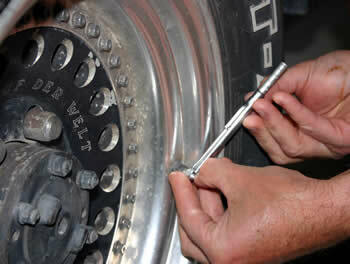 Tighten up the axle bolts. Is your truck and trailer safety kit complete? Do you have extra halters and lead ropes? By spending the time to prepare for the road, you help to ensure the safety of your precious cargo, yourself and your fellow travelers. Happy trails! Michelle Staples is the author of Save Your Horse! A Horse Owner's Guide to Large Animal Rescue and the "Teach It Yourself Class" Horse Awareness and Safety. You can contact her through the Large Animal Rescue website, www.saveyourhorse.com or info@redjeansink.com. Type "Contact author" in subject line.